Spanish Uruguay is a Spanish School located in the South American country of Urguay. We offer intensive Spanish courses across Uruguay, in the picturesque cities of Montevideo, Atlántida, and Punta del Este at the best competitive prices. Our team is made up of a group of professionals who have many years of teaching experience and who have helped us shape the high-quality pedagogical space we have today. Everyone on our professional team is dedicated to understanding and applying the most modern and effective language-teaching methods. Our Spanish students are university students, teachers, professionals and tourists. They are people who need Spanish for school or work, or people learning Spanish for cultural reasons: they love our language and our culture! The variety of interests, ages and nationalities makes our groups extremely interesting and makes learning Spanish with us tons of fun! 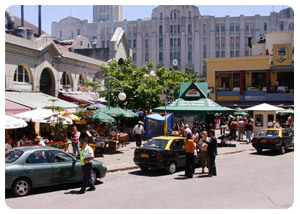 Take an intensive Spanish course in Uruguay! The essential point of reference for our teaching is the student. Our teachers find it important to encourage and motivate each and every student. All courses are geared towards promoting the incorporation of Spanish language and Spanish-speaking cultures in the lives and minds of our students. We emphasize speaking and listening skills, but we also know that Spanish should not be taught the same way a person learns to speak with friends and travel buddies, so we also teach reading, writing, and grammatical structures. But, either in our individual classes or group classes, when you tell us what you want out of the class and what your final goals are (whether its speaking Spanish at work, taking an exam, reading novels in Spanish, etc), we will personalize activities and assignments for those goals.